Once known as the "Little Paris", Bucharest, Romania's capital, is known for its wide, tree-lined boulevards, and glorious Belle Époque buildings. There is even an Arc de Triomphe on a boulevard longer than the Champs Elysees, with a range of trees that flower beautifully in the spring. 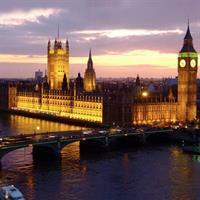 You will be intrigued by the city's eclectic mixture of architecture, from old monasteries to Orthodox Churches, Second Empire mansions, the stolid Stalinist architecture of the communist years and the colossal Parliament House, the second largest building in the world after the Pentagon. Brasov is a charming town located in the geographical centre or Romania and is one of the most visited places in Romania. Founded in 1211 on an ancient Dacian site, Brasov exudes a distinct medieval ambiance. Stroll around the old Town Hall Square where you can admire colorfully painted and ornately trimmed baroque structures. Don't miss the Black Church, the largest gothic church in Romania. The interior is impressive and well-kept and houses one of the largest organs in Eastern Europe. The "Brasov Citadel Fortress" is another interesting site. Poiana Brasov, mainly a ski resort, but also a sightseeing spot is just outsite the city. The nearby Bran Castle, attracting many fans of Dracula can be easily reached from Brasov. Sibiu was the largest and wealthiest of the seven walled citadels built in the 12th century by Transylvanian Saxons. The city of Sibiu holds one of the best preserved historical sites in the country, many of its medieval fortifications having been kept in excellent state. Its old center has begun the process for becoming a UNESCO World Heritage Site in 2004. 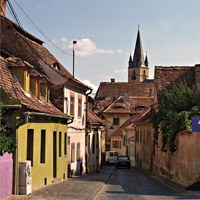 Sibiu and its surrounding area have many significant museums. Brukenthal Palace, one of the most important Baroque monuments in Romania houses the main part of the National Brukenthal Museum, opened in 1817. In 2007 Sibiu was the European Capital of Culture. The city also lies close to the Fãgãraº Mountains - a very popular trekking destination. Situated in the western Romania on the banks of the river Mures, Arad is a modern-built city and contains many beautiful buildings. It is an important industrial center and transportation hub, it is also the seat of a Romanian Orthodox bishop and features two universities, a Romanian Orthodox theological seminary, a training school for teachers, and a music conservatory. The Fortified Town of Arad is one of the Transylvanian fotresses built in the Vauban star-shaped style. Arad's city hall is an impressive building which has to its right and left another two palaces 2 centuries old. Other tourist sites that well worth a visit are: Neuman Palace, Judiciary Palace, Cenad Palace, Bohus Palace and The Old Theatre (Hirschl), built by Jacob Hirschl in 1817, the oldest stone theatre in Romania. Maramures is an ancient Dacian region, rich in gold, uranium and other minerals, located in the north-west of Romania about 500 kms from Bucuresti. Maramures is an ideal area for people who like the outdoor and Baia Mare is a good starting point for exploring the region. 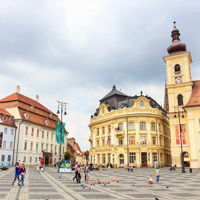 Due to the concentration of economic activities found in the city and their importance, Baia Mare ranks third in northwest Romania, after Cluj Napoca and Oradea. The area is quite mountainous, the Rodna Mountains and the Pietrosul Massif are the highest peaks in the Oriental Carpathians. Some of the mountains such as the Gutai and Tibles Mountains are of volcanic origin. If you happen to trace some places mentioned in the Dracula novel, then Bistrita is a place not to be missed. This is the area that Bram Stoker chose as the setting of Dracula's castle. The capital of the Northern Bistrita- Nãsãud County has several well preserved medieval buildings, an Orthodox church dating from the 13th century and a county Museum. The Bistrita-Nãsãud County Museum, located in a former barracks, contains Thracian, Celtic, and German artifacts. Another attraction of Bistrita's central square is the Lutheran church which was built by the Transylvanian Saxons, originally constructed in the 14th century in Gothic style but remodeled from 1559-1563 by Petrus Italus with Renaissance features. Sibiu was the largest and wealthiest of the seven walled citadels built in the 12th century by Transylvanian Saxons. The city of Sibiu holds one of the best preserved historical sites in the country, many of its medieval fortifications having been kept in excellent state. Its old center begun the process for becoming a UNESCO World Heritage Site in 2004. Sibiu and its surrounding area have many significant museums. Brukenthal Palace, one of the most important Baroque monuments in Romania houses the main part of the National Brukenthal Museum, opened in 1817. 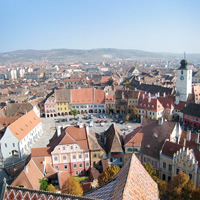 In 2007 Sibiu was the European Capital of Culture. The city also lies close to the Fãgãraº Mountains - a very popular trekking destination.